Trekking is the most famous choice among the many things that Nepal offers. Not only is the country perfect for trekking journeys, it also offers a grand blend of various ethnic cultures and landscapes to enjoy while doing so. 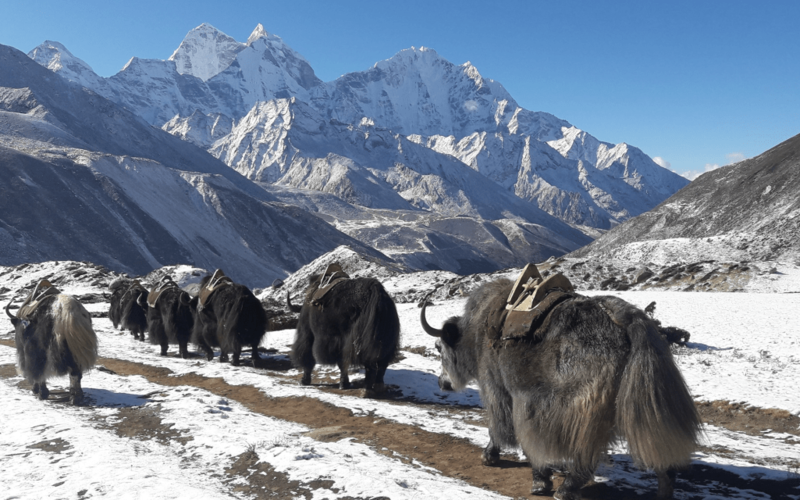 Trekking can be done at almost all parts of Nepal, from the dry and arid desert-like terrains of Mustang and Dolpo to the snow-covered Himalayan paradise-like settings of the Khumbu and the Annapurna. Furthermore, famous trekking journeys like the Everest Base Camp Trek and the Annapurna Circuit Trail pull in large numbers of people from all parts of the world every year. One of the most fascinating things about Nepal trekking is that each region that the country presents trekking at has its own unique hallmarks. Each region is different in terms of ethnic people, the prominent culture, landscape, Himalayas, flora and fauna. But one thing each region has in common is that they present amazing trekking experiences! There are 100s of different ethnic people residing in Nepal. From their own unique culture and tradition to having amazing idiosyncratic costumes and dialect, the cultural riches of the country is truly fascinating to experience. Moreover, Nepal also has many temples and old monuments that reflect the history of the country beautifully in their art and architecture. As a matter of fact, Nepal is among the few countries that has the densest concentration of World Heritages situated close to one another. From the Natural World Heritage Sites like the Sagarmatha and the Chitwan National Parks to important religious pilgrimage settings like Lumbini (the birthplace of Lord Buddha) and the Pashupatinath, Cultural Tours in Nepal are never deprived of amazing locations and revered shrines and temples. Additionally, the culture of the people is also reflected brilliantly on the wood carvings, stone masonries and metal work on the countless temples and buildings the country has. Peak Climbing is one of the more extreme adventures that can be done in Nepal. Currently, the Nepal Mountaineering Association has divided specific peaks as “Trekking Peaks” that can be climbed all the way to the summit. With higher stakes than the regular base camp treks, peak climbing in Nepal is a matter of enduring any curve ball the treacherous mountain peak throws your way and reaching the summit. Following the legendary Sherpa and using equipments like crampons and karabiners, peak climbing is definitely an adrenalin filled event that bestows amazing rewards to anyone who pursues it. In addition to being the land of the Himalayas, Nepal is also a country rich in water-resources. The country is drained by various Himalayan Rivers and glaciers. As such, white water rafting is quite popular in Nepal. The rapidly flowing rivers of the country offer a completely thrilling experience! Nothing tops riding the fast-flowing currents of the white rivers of Nepal. Apart from strenuous trekking journeys, Nepal also has many destinations that offer short hiking trips. With many hiking destinations lying close to major cities like Kathmandu, going on hikes definitely is a good alternate option for people who still want to experience the beauty of the country without doing extended trekking trips. Because of the natural beauty of the country, hiking in Nepal always presents many mesmerizing attributes. Panoramic views of the Himalayas from vantage points, tranquil woods and forest trails, historical monuments and hill-parks built in the memory of Nepal’s heroes and amazing views of the open valleys and cities are some of the hallmarks that hiking presents. There are many more things to do in Nepal. It is a country that definitely should be on the list of places to travel. Furthermore, not only is the country relatively cheap, but it also presents amazing places and topography that are quite enjoyable and fun.